Implicit memory is a type of memory in which previous experiences aid in the performance of a task without conscious awareness of these previous experiences. Evidence for implicit memory arises in priming, a process whereby subjects are measured by how they have improved their performance on tasks for which they have been subconsciously prepared. Implicit memory also leads to the illusion-of-truth effect, which suggests that subjects are more likely to rate as true those statements that they have already heard, regardless of their veracity. In daily life, people rely on implicit memory every day in the form of procedural memory, the type of memory that allows people to remember how to tie their shoes or ride a bicycle without consciously thinking about these activities. Research into implicit memory indicates that it operates through a different mental process from explicit memory. Advanced studies of implicit memory began only a few decades ago. Many of these studies focus on the effect of implicit memory known as priming. Several studies have been performed that confirm the existence of a separate entity which is implicit memory. In one such experiment, participants were asked to listen to several songs and decide if they were familiar with the song or not. Half of the participants were presented with familiar American folk songs and the other half were presented with songs made using the tunes of the same songs from group 1 but mixed with new lyrics. Results show that participants in group 1 had a much higher chance of recalling the songs as being familiar, even though in both groups, the tunes of the songs were the same. This study shows that people are even implicitly making connections amongst their memories. Much memory study focuses on associative memory, or memories formed between two entities, linking them together in the brain. This study shows that people implicitly make a strong associative connection between a song's tune and its lyrics that they can't separate later. According to Daniel L. Schacter, "The question of whether implicit and explicit memory depend on a single underlying system or on multiple underlying systems is not yet resolved." The findings display such a variety of phenomena that there has not yet been a theory to account for all of the observations. Instead, two theories have been presented to explain different subsets of the data. There are usually two approaches to studying implicit memory. The first is to define a characteristic associated with explicit memory. If a person with a normal working memory can solve the task (e.g. 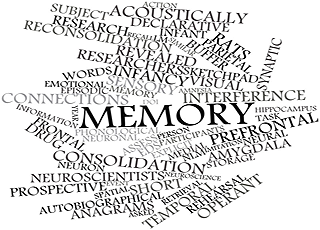 remembering a list of words), then they are consciously recalling a memory. The second approach invokes neither a conscious nor an unconscious response. This approach is dependent on many independent variables which affect the response of a person's implicit and explicit memory. Empirical evidence suggests infants are only capable of implicit memory because they are unable to intentionally draw knowledge from pre-existing memories. As people mature, they are usually capable of intentional recollection of memory, or Explicit memory. However, amnesic patients are usually the exception to developing memory, but are still capable of undergoing priming, to some extent. Since procedural memory is based on automatic responses to certain stimuli, amnesic patients are not affected by their disability when behaving habitually. Activation processing is one of two parts in Mandler's dual processing theory. According to Mandler, there are two processes that operate on mental representations. The first is activation, where increased activity causes a memory to be more distinctive. This increases the familiarity component of the memory, which explains results from priming effects. The second is elaboration, which is a conscious memory used to encode explicit memories that involves activation, but also creating new relationships amongst existing memories. The multiple memory system theory ascribes the differences in implicit and explicit memory to the differences in the underlying structures. The theory says that explicit memories are associated with a declarative memory system which is responsible for the formation of new representations or data structures. In contrast, implicit memories are associated with a procedural memory system where memories are just modifications of existing procedures or processing operations. The illusion-of-truth effect states that a person is more likely to believe a familiar statement than an unfamiliar one. In a 1977 experiment participants were asked to read 60 plausible statements every two weeks and to rate them based on their validity. A few of those statements (some of them true, others false) were presented more than once in different sessions. Results showed that participants were more likely to rate as true statements the ones they had previously heard (even if they didn't consciously remember having heard them), regardless of the actual validity of the statement. As the illusion-of-truth effect occurs even without explicit knowledge, it is a direct result of implicit memory. Some participants rated previously heard sentences as true even when they were previously told that they were false. The illusion-of-truth effect shows in some ways the potential dangers of implicit memory as it can lead to unconscious decisions about a statement's veracity. A form of implicit memory used every day is called procedural memory. Procedural memory lets us perform some actions (such as writing or riding a bike) even if we are not consciously thinking about it. In one experiment two groups of people, one composed of amnesic patients with heavily impaired long-term memory, and the other composed by healthy subjects, were asked several times to solve a Tower of Hanoi puzzle (a complex problem-solving game that requires thirty-one steps to complete). The first group showed the same improvements over time as the second group, even if some participants claimed that they didn't even remember having seen the puzzle before. These findings strongly suggest that procedural memory is completely independent from declarative memory. In another experiment two groups of people were given a flavored carbonated drink. The first group was later exposed to motion sickness, and these participants developed a taste aversion against the carbonated drink, even if they were made aware that the drink didn't lead to the motion sickness. This shows that there appears to be an implicit, procedural memory that subconsciously links the sickness and the drink flavor. It is debated whether implicit attitudes (that is, attitudes people have without being consciously aware of them) belong under the category of implicit memory or if this merely involves a pragmatic approach to asserting knowledge. In some ways, implicit attitudes resemble procedural memory as they rely on an implicit, unconscious piece of knowledge that was previously learned. Evidence strongly suggests that implicit memory is largely distinct from explicit memory and operates through a different process in the brain. Recently, interest has been directed towards studying these differences, most notably by studying amnesic patients and the effect of priming. The strongest evidence that suggests a separation of implicit and explicit memory focuses on studies of amnesic patients. As was previously discussed in the section on procedural memory, amnesic patients showed unimpaired ability to learn tasks and procedures that do not rely on explicit memory. In one study, amnesic patients showed a severely impaired ability in verbal long-term memory, but no impairment in their memory for learning how to solve a certain motor task called a pursuit rotor. Patients showed this improvement over time even while claiming on each occasion to have never seen the puzzle before. This result indicates that the mechanism which allows for long-term declarative memory does not have a similar effect on implicit memory. Furthermore, studies on priming in amnesic patients also reveal the possibility of an intact implicit memory despite a severely impaired explicit memory. For example, amnesic patients and a control group showed similar improvements in word completion as a result of priming, even if they had no memory of being involved in a previous test. That priming occurs without the involvement of explicit memory again suggests that the two types of memory have different functions in the brain. Besides the study of amnesic patients, other evidence also indicates a separation between implicit and explicit memory. Basic patterns that exist for explicit memory development do not apply to implicit memory, implying that the two are two different processes. Children tested at various increasing ages, in different stages of development, do not exhibit the same increase in performance in implicit memory tasks the way they always do with explicit memory tasks. The same is true for elderly people. Studies show that as people grow older, their performance on explicit memory tasks declines, however their performance on implicit memory tasks does not decline at all. Many experiments have been performed to demonstrate the differences between implicit and explicit memory. One such method of differentiation is revealed through the depth-of-processing effect. In a 1981 study by Jacoby and Dallas, subjects were first given a list of words and asked to engage with them in some way. For some of these words, subjects were asked to interact with the words in a relatively superficial way, such as counting the number of letters in each given word. For one set of words, subjects performed tasks that required elaborative processing (denotation), such as answering questions about a word's meaning. They were then given a test that assessed their ability to recognize whether they had seen the word in the studying part of the experiment. Because depth of processing aids in the explicit memory of a word, subjects showed better memory for the words that required elaborative processing on this test. When implicit memory was tested through flashing words on a screen and asking subjects to identify them, however, the priming effect was extremely similar for the words that involved elaborative processing as compared to the words that did not. This suggests that implicit memory does not rely on depth of processing as explicit memory does. The same study also tested the effect on memory by priming the words via an auditory test and then testing through visual stimuli. In this case, there was little decline in the priming effect when patients were tested explicitly by merely being asked whether they recognized hearing the word in the first part of the experiment. On the word identification test of implicit memory, however, the priming effect was severely reduced by the change in modality from the studying part to the testing part. A later study showed that attempts to interfere with the memory of a list of words significantly impacted subjects' ability to recognize the words in a test of explicit recognition, but the interference did not have a similar effect on the subject's implicit memory of the words. Also, there seems to be no statistical correlation between a person's ability to explicitly remember a list of words and their ability to subconsciously use the priming effect to aid performance in identifying previously seen words in tests of word completion. All of these results strongly indicate that implicit memory not only exists, but exists as its own entity, with its own processes that significantly differ from explicit memory. Look up Implicit memory in Wiktionary, the free dictionary. Please browse our fully updated library of professionally produced Hypnosis Downloads and Hypnosis Scripts for advanced self hypnosis audio mp3s and indirect hypnotherapy scripts relating to: implicit memory, implicit memory definition, implicit memory priming, activation processing, explicit memory, illusion of truth effect, multiple memory system, procedural memory, subconscious priming, what is implicit memory. Please browse our Hypnosis Online Store for books, cds, downloads, dvds, ebooks, mp3s, scripts, and videos relating to: implicit memory, implicit memory definition, implicit memory priming, activation processing, explicit memory, illusion of truth effect, multiple memory system, procedural memory, subconscious priming, what is implicit memory. Please visit Hypnotic-world.co.uk for advanced self hypnosis audio mp3s, hypnosis courses, and hypnosis pdf relating to: implicit memory, implicit memory definition, implicit memory priming, activation processing, explicit memory, illusion of truth effect, multiple memory system, procedural memory, subconscious priming, what is implicit memory. Please visit Hypnotic-world.com for more information relating to: implicit memory, implicit memory definition, implicit memory priming, activation processing, explicit memory, illusion of truth effect, multiple memory system, procedural memory, subconscious priming, what is implicit memory.